Qt Creator provides support for building and running Qt applications for desktop environment and mobile devices. 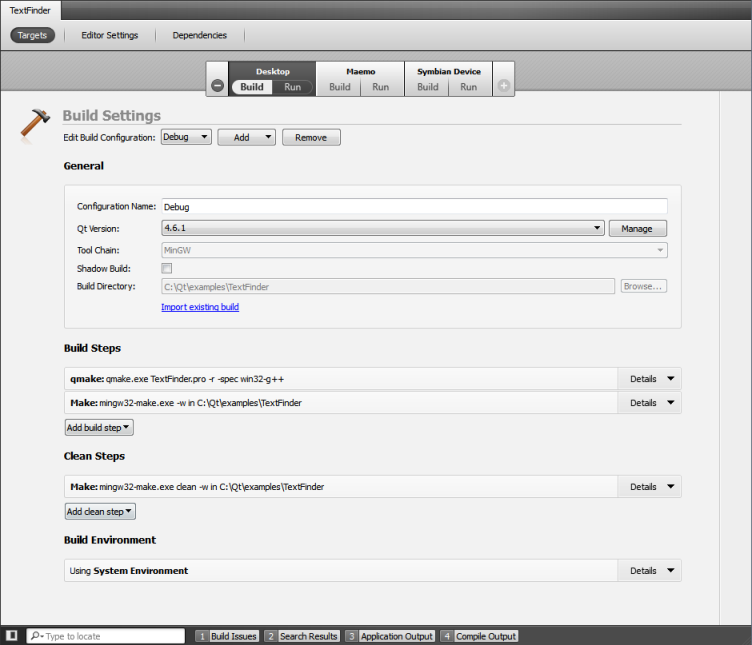 When you install the Nokia Qt SDK, the build and run settings for the Maemo and Symbian targets are set up automatically. You can add a target if the necessary tool chain is installed on the development PC and the Qt version is configured. Click and select from a list of available targets. To remove a target, select it and click . You can select the targets and click the Run button to build and run the applications on the targets. You can click the Build All button to build all open projects, one after another. To view and modify the settings for currently open projects, switch to the Projects mode by pressing Ctrl+5. Targets Note: If you have installed only one tool chain, the Targets tab is replaced by a Build and Run tab. Use the Build and Run buttons to switch between the build and run settings for the active project. If you have multiple projects open in Qt Creator, use Select a Project option at the top to navigate between different project edits.